The clergy and parishioners of the Synodal Cathedral of the Sign in New York City celebrated the great feast of the Theophany of the Lord. 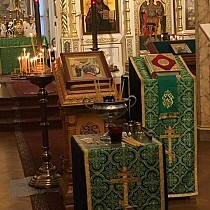 On Saturday, January 19, Bishop Nicholas of Manhattan celebrated Divine Liturgy in the cathedral, co-served by cathedral clergy: senior priest Archpriest Andrei Sommer, Archpriest Edward Chervinsky, Abbot Eutychius (Dovganyuk; cleric of St. Gregory the Theologian Church in New York City), and Protodeacons Nicolas Mokhoff and Vadim Gan. Singing at the divine services was the Synodal choir under the direction of conductor Peter Fekula. A multitude of parishioners came to pray at the divine service, most of whom confessed their sins and communed of Christ’s Holy Mysteries. Upon completion of Liturgy, Bishop Nicholas performed the Rite of the Great Blessing of the Water, and then sprinkled the church and faithful with holy water. Parishioners were then able to gather holy water, in order to bless their own homes and drink of it throughout the year. His Grace congratulated those present with the feast, and thanked them for their prayers. "This great feast is a lesson for us. Christ came to earth, became man, in order to save man; He received baptism, in His humility, from a man, John the Baptist, and not in some grand city, but in the desert, in the River Jordan. 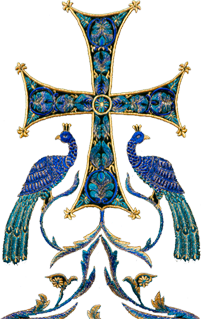 He sanctifies the nature of water – water, without which we cannot live, just as we cannot live without the Lord, without the grace of the Holy Spirit, without the Church. And today we receive this lesson: we must humble ourselves before God, and ask forgiveness for all of our sins, voluntary and involuntary. "The Lord Himself showed us this example, and we must see and feel it. Today, holy water is being distributed in Orthodox churches. Keep it piously, just as you do the Paschal Artos. And drink it little by little with prayer, in case of illness, worry, or strife. And let us humble ourselves before God and one another, and labor unto the salvation of our souls and the souls of those around us." The cathedral sisterhood then invited the clergy and faithful to a festal luncheon, during which their brotherly interaction continued. Afterward, Bishop Nicholas departed for Boston, MA, where he will take part in the parish festivities of Holy Epiphany Church.